The Great Lakes are a very special place; I’ve written about it before, seems like I just can’t get enough of the beauty and grandeur! Just recently I had our Edgewood Volleyball team in the Mackinaw City area, in fact we were able to ferry across to Macinac Island itself; we spent a night at the Grand Hotel, which is a treat all on its own! I awoke on Wednesday, July 10 and made my way down to the 700 foot covered wooden front porch of The Grand (the largest in the world) and made my way to the end of the porch that is closest to the Mack Bridge…I thought I would enjoy the morning and maybe, just maybe…catch a glimpse of one of the big ships that pass through the straits. What I didn’t know was how lucky I was going to be…there before me, under the main span of the bridge was a big ship…it was steaming directly at us and you could see that it was of major proportions. It would be an understatement to say that my curiosity had been piqued…I watched and waited eagerly as it drew closer, minute by minute the ship pushed on for our location and I knew that it would pass directly in front of The Grand on its way upbound for Lake Superior. I couldn’t make out the name below the wheel house…no matter how hard I tried, but as luck would have it there was a gentleman taking photos to my right, he had a very large lens and I asked him if he could take a photo and zoom in…sure enough he did and there in plain print was Edwin H. Gott. 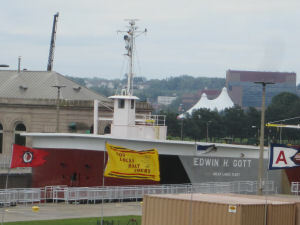 It was the same ship that we (volleyball team from last summer) had watched go through the Soo Locks about a year ago. My brain was spinning and I grabbed my I-pad, logged on, and caught up on the facts of the matter; the ship was 1004 feet long and from a volume standpoint…the largest ship on the Great Lakes! Now, just don ‘t gloss over the 1004 foot mark…envision 3 football fields sitting side by side, then add another third and you will have a better appreciation of how large this ship happens to be. From the ships website I could track its location and sure enough, there it was shown directly in front of Mackinac Island. It was steaming along at a cool 14 knots and indeed was headed for the Soo Locks. It was 7:45am and from the website I could tell it was going to take the Gott 7 hours to arrive at the site of the locks at Sault Ste. Marie in the upper peninsula of Michigan. I did some quick calculating and easily could tell that we would be there in time to see this behemoth come through the locks…what a treat! Let me throw one staggering fact at you; when a ship the size of the Gott is loaded…it burns up one gallon of fuel for every 17 to 20 inches that it travels! I have done the math and let’s just use a simple estimate that for every mile the ships steams it burns up over 3500 gallons of fuel! That is a total that is simply too much for me to fathom? The engine supplies a staggering 19,500 horsepower…which is the largest on the Great Lakes and has a total capacity of over 74,000 tons. The girls and I had our breakfast, did a little shopping, crossed back to the mainland, got in the bus…drove 50 miles north…arrived at the Locks with about 2 hours left to burn before the big ship came in. If you haven’t been to Sault Ste. Marie, do yourself a favor and put it on the list of to-do’s as it is a neat town and the facility at the locks is very interesting. There is a main exhibition area that has a bunch of facts about all five great lakes, along with a ‘boat load’ of other interesting photos, etc….all associated with shipping and how the boats get from Lake Superior (the upper St. Mary) through the locks and downbound to the other great lakes (through the lower St. Mary). It is no secret that this ability to go from the lower river to the upper river (over 21 feet), and vice versa, was one of the key efforts in winning WWII…as it allowed vast amounts of iron ore to move from Minnesota to Gary where it was turned in to steel for making all types of war necessities. 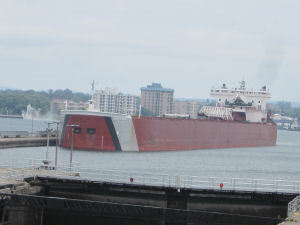 All of us watched in amazement as the big freighter slowly eased into the Poe Lock, then came to within just a few feet of completely filling up the entire length of the massive lock…all before being raised 21 feet and passing along up river on its way to Lake Superior and its destination in Minnesota. Maybe I am the only one who stood mouth agape at this sight…but if so, I am OK with it as something of this nature, which is man-made…, is just awe inspiring. I had started my day off with this great ship and watched as it slowly moved on towards its final destination and had to just shake my head…if you are looking for a great time in a land filled with beauty galore…then please plan your trip and set your sights north to the “upper” country (the UP). I am sure that you won’t be disappointed as you Enjoy the Great Outdoors.